"This is an easy, delicious recipe I got from a local restaurant. I make this every spring when asparagus is abundant here. I think because of the sherry this soup has a wonderful nutty flavor. This can easily be made as a low-calorie soup by using 1 tablespoon olive oil instead of the butter, and by omitting the heavy cream. Just add a little cornstarch to thicken, if needed." Chop the asparagus. Set aside 2 cups of the asparagus tips. Melt the butter in a stockpot over medium heat. Cook the asparagus, onion, celery, and garlic in the melted butter until beginning to soften, 2 to 3 minutes. Add the sherry and chicken stock; bring the mixture to a gentle boil, reduce heat to medium-low, and simmer for 45 minutes. Remove from heat and allow to cool at least 30 minutes. Pour the soup into a blender, filling the pitcher no more than halfway. Hold the lid in place with a folded kitchen towel and carefully start the blender, using a few quick pulses to get the soup moving before leaving it on to puree. 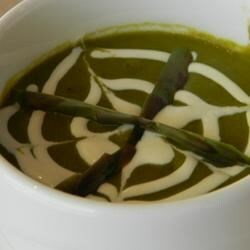 Return the blended soup to the stockpot; stir in the reserved asparagus tips and the heavy cream. Cook over medium heat until soup is hot and the asparagus tips are heated through but still crunchy, about 3 minutes. Season with salt and pepper. Delicious and very simple. Only difference, I used dry white wine instead of the sherry and a stick blender. Great easy recipe. Thanks! do we use the asparagus that was set aside or save it for another purpose? If so, when do we add it? I make this same soup but for those who prefer a chunkier soup delete using the blender portion. It is terrific both ways and my hubby loves this recipe. If I could give this a 10 star I would. this is a great and easy recipe, the kids liked it as well. I added some mushrooms to the list of ingredients. thanks! GREAT! my hubby and son loved it! Awesome recipe! I did not change a thing. Thanks Miss Diane!